Heat oven to 450°F. Grease jelly roll pan, 15 1/2x10 1/2x1 inch. 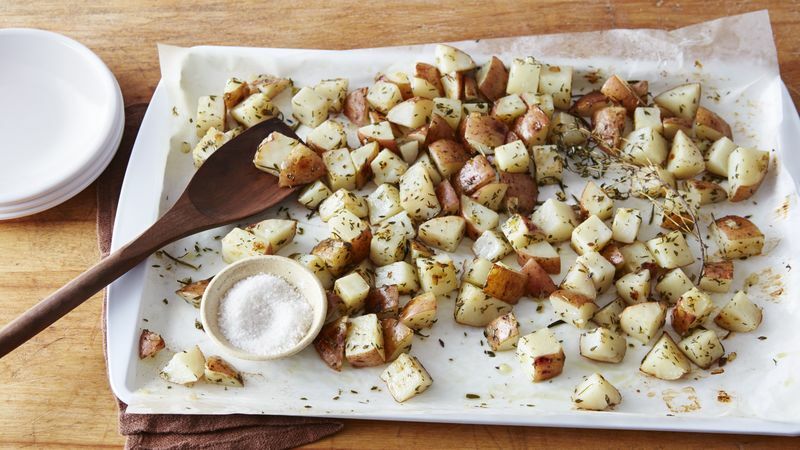 Cut potatoes into 1-inch chunks. Mix remaining ingredients in large bowl. Add potatoes; toss to coat. Spread potatoes in single layer in pan. Bake uncovered 20 to 25 minutes, turning occasionally, until potatoes are light brown and tender when pierced with fork. Get even more flavor from dried thyme and other herbs by rubbing the flakes with your fingers to release their fragrance before adding to a recipe. Garlic lovers can add a few cloves of peeled garlic with the potatoes.